Waiting for Haveri District Village Accountant Syllabus 2017-2018 and Exam Pattern? then feel free and take a look at this article. 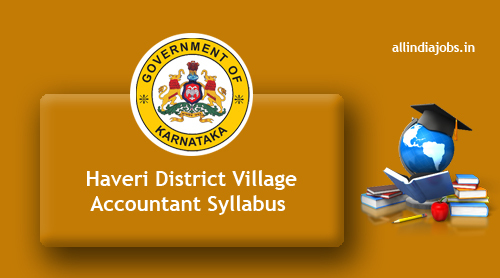 In this post, all the applicants of Haveri District Village Accountant Jobs can get the complete Syllabus along with Exam Pattern. The Haveri District Revenue Department is ready to organize the Written Exam for Village Accountant Post at different examination centers in upcoming months. So those who are going to take a part in the written test on scheduled dates need to know about the complete info related to subjects, topics and sub topics. So better to refer this blog very carefully before the examination date. The Haveri District Revenue Department had released new recruitment notification named as Haveri District Village Accountant Recruitment 2017. A few days back, the officials are stated that they are ready to recruit the capable candidates for 31 Village Accountant Vacancies. Those who are interested to build their career with Karnataka Government can utilize the golden chance by applying Haveri District Village Accountant Job Openings 2017. As the starting date to apply is 7th November 2017 as well as the closing date to apply for the recruitment is 6th December 2017. The late applications are directly rejected by the Haveri District Revenue Department. To avoid last minute rush apply on or before the deadline. Till now, many of the job hunters had applied for Haveri District Village Accountant Recruitment 2017 and seeking for Haveri District Village Accountant Syllabus 2017-2018 in different websites but no one can’t find the proper details. For the sake of candidates, we tried our level best and gathered most precise information related to Haveri District Village Accountant Written Exam Syllabus and Exam Pattern. Interested aspirants can check this article thoroughly in the below sections you can get Exam Pattern, Selection Process and subject wise Syllabus. Haveri is a district in the state of Karnataka, India with the potential to become a tourist hub. As of 2001, it had a population of 1,439,116 of which 20.78% were urban residents. The official website of Haveri District Revenue Department is www.haveri.nic.in. Every year many of the unemployed candidates are making their bright future with this organization. The authority provides many facilities to their employees so it is better to chance to get a job in this authority. If you want to know about the mandatory news like time duration, a total number of questions, each question carries and negative marking then wait few more days because soon the Haveri District Revenue Department release the Syllabus and Exam Pattern for Village Accountant. The Haveri District Revenue Department selects the candidates by conducting Written Exam and Personal Interview. Get the subject wise Haveri District Village Accountant Syllabus 2017-2018 in this section. The aspirants who are eagerly looking for Haveri District Village Accountant Syllabus this is the correct site to get the entire details. Many of the aspirants had already started their preparation by referring the Syllabus. The Village Accountant Syllabus gives a clear idea about the subjects and topics covered in the written test. In preparation time the syllabus plays a key role. The candidates who will refer according to the syllabus he/she can manage the given time in the examination and secure good marks. The aspirants who refer the syllabus in preparation time they can write the written test without any confusion. Hope the syllabus provided on this page is quite enough for the aspirants. Stay in touch with our website www.allindiajobs.in on regular basis.